Being right on the beach, it only makes sense that many of our weddings have a beach theme. But a nautical theme, which also goes so well with our oceanside destination, is so fun as well! 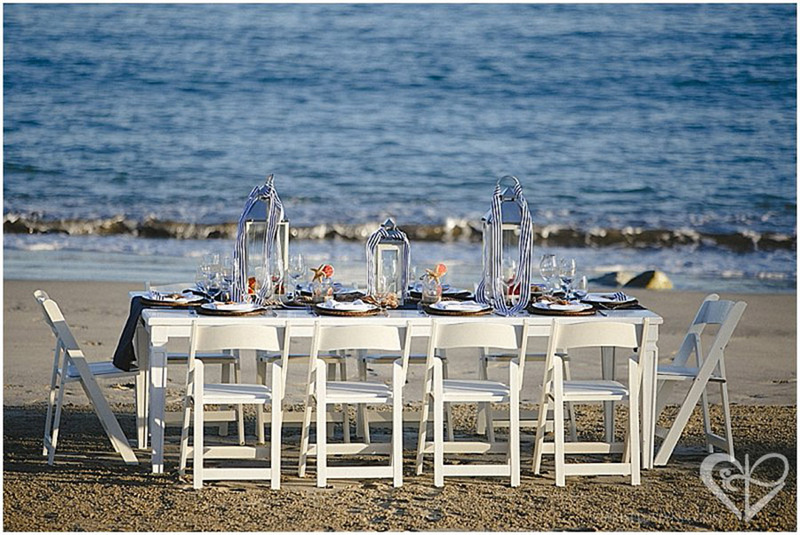 Tapping into blue and white stripes, we at The Main Event Cabo fell in love with this wedding set-up. Sometimes it is something as simple as that – blue and white stripes – which helps to create a vision. Our couple, Amber and Sam, also loved wicker and starfish. With our wicker chargers, we could add that design element, and it fit flawlessly with the white table and white beach chairs. No heavy linen was needed, and the runner in navy provided the perfect contrast to the smooth white tables. The white lanterns, which are actually practical and added a warm glow throughout the evening, were a perfect fit for the nautical table. And then, notice the same blue and white ribbon stripe being carried out on the napkin. If you want a specialized detail like this, just ask! We specialize in personalizing your event to YOU! You want something special and we don’t have it? Ask and we’ll see if we can have it made for you. That’s what we did with these napkins, and they were such a cute detail! Another thing to remember as you are planning your decor design is where exactly this decor will be set-up. This reception was set up on the actual sand, and so this decor made sense. It was nautical in a ballroom…it was nautical on the beach, with crashing waves within view. A perfect fit!